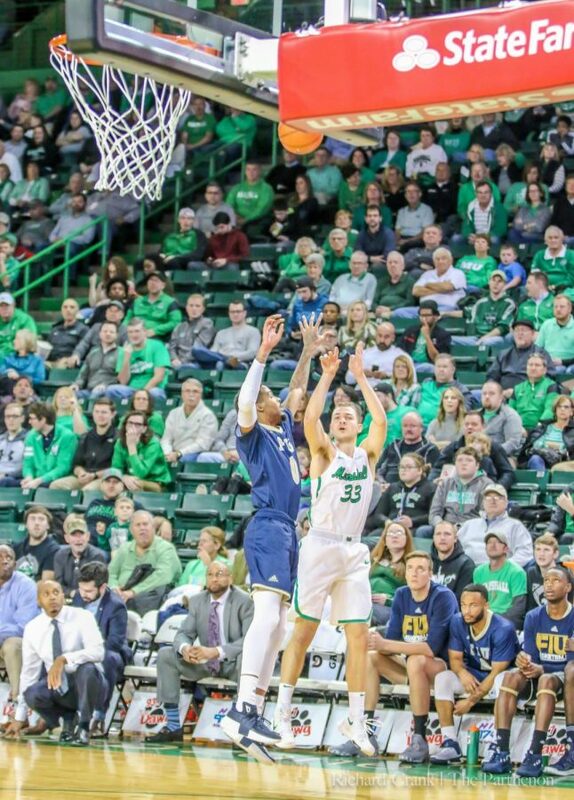 Marshall guard Jon Elmore (33) shoots a 3-pointer around an FIU defender during their matchup in the 2017-18 season. 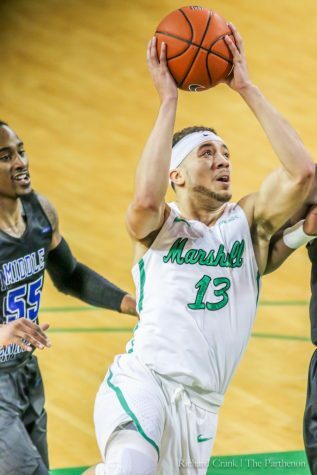 Elmore's shooting from beyond the arc is a staple in Marshall's offense. 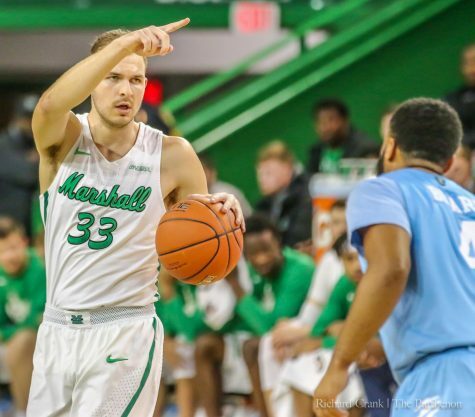 Marshall men’s basketball (16-8, 7-4 C-USA) edged the FIU Panthers (11-4, 5-7 C-USA) 76-66 Thursday night at the Cam Henderson Center. The trio of Elmore, junior guard C.J. 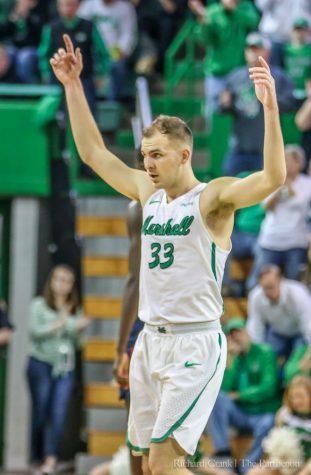 Burks and junior forward Ajdin Penava led the Herd on offense. Elmore finished the game with 22 points, six rebounds and six assists. He made a season-high six threes. Burks tallied 16 points, with three assists and two steals, and Penava recorded his eleventh double-double of the season. 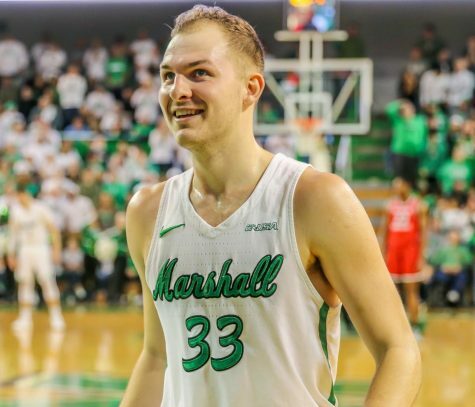 He led the Herd in scoring with 25 points, while he registered 12 rebounds and five blocks. 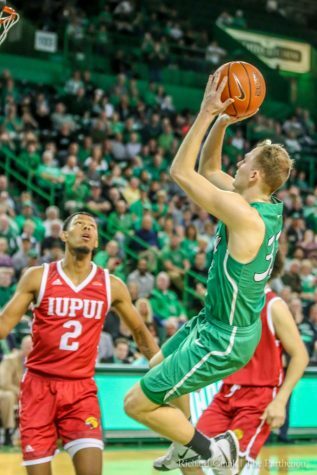 Penava still leads the nation in blocks, as he surpassed 100 blocks on the season against in Marshall’s victory. 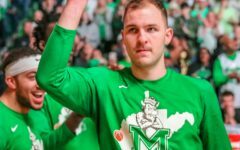 The Herd committed 19 turnovers—its second-highest total of the season—but made up for it in shooting. 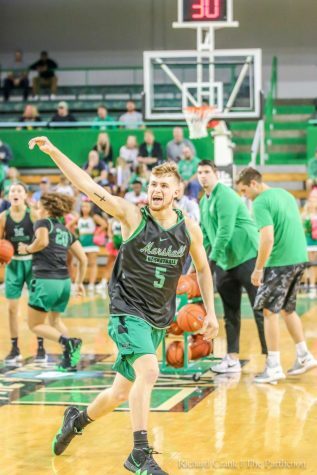 Marshall finished shooting 48.3 percent (28-58) from the field, 33.3 percent (10-33) from three, and 71.4 percent (10-14) from the line. Four FIU players scored in double-digits. Sophomore guard Trejon Jacob finished with 16 points and junior guards Josh Stamps, Eric Lockett and Brian Beard Jr. tallied 15, 12 and 11 points, respectively. Beard and Stamps contributed a combined 8 steals out of the Panthers’ team total of 11. The Panthers, however, shot only 46.2 percent (12-26) at the line—contributing to their defeat. 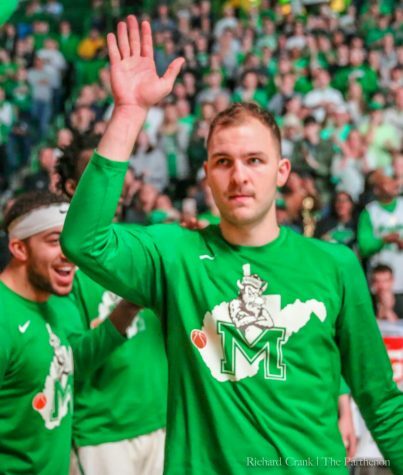 Marshall plays its second-straight home game Saturday night against the FAU Owls. 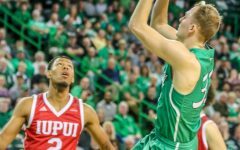 The Owls travel to Huntington coming off a loss against WKU. Tip-off is set for 7 p.m.